MET IIT, NASSCOM & Technology Law Forum have joined hands to conduct a year long series of lectures & discussions. The discussions will be spearheaded by Rajiv Vaishnav & MET IIT experts and will shed light on various topics related to Technology, Law, Cyber Crime, Documentation Procedures etc. The first lecture in the series was a focused Tech-Law Discussion Series for the Animation and Gaming Industry through the Game Industry Forum for Technology and Trade (GIFTT) platform. 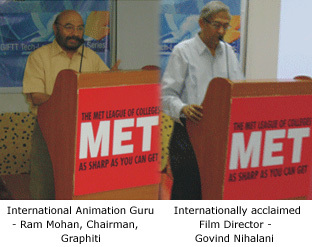 Prominent speakers included Animation Guru Ram Mohan, internationally acclaimed Film Director Govind Nihalani and eminent lawyer - N S Nappainai.